In his series of Unique Golf Courses of the World, this month Scottish Bob turns his sights on Golfing in New Zealand! Today there are approximately 390 golf courses in New Zealand which puts it second in the world for golf courses per capita, from a population of only 4 million. Only Scotland with approximately 543 golf courses per capita of around 5 million has more courses. Golf has been played in New Zealand since 1871 when the Otago Golf Club was formed with many golf clubs forming shortly after. However, I would like to bring what I myself would call, a unique golf course which was founded in 1906 and it is The Rotorua Golf Club and the Arikikapakapa course. This means ‘The Gentle Sound of Plopping Mud’! 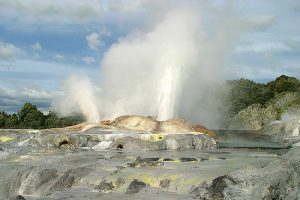 The Rotorua Golf Club is the only Geothermal golf course in New Zealand. The course has 18 holes and is a par 70, each hole is played over and around both dormant and very active thermal areas. This provides each golfer with a great variety and a very challenging round of golf. 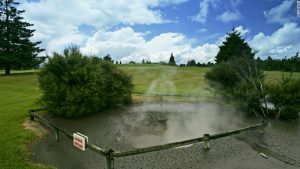 The geothermal uniqueness of this golf course has earned it, an international reputation which you should not miss if you are golfing in New Zealand. Whilst playing this golf course there are a number of bubbling hot mud pools & hot steam vents that are to be avoided, especially on the left of the 9th green. In addition, there is a strange sulphur mound on the right side of the same green. This unique golf hole was featured on a New Zealand stamp and has been written about by my many golf writers from around the world. 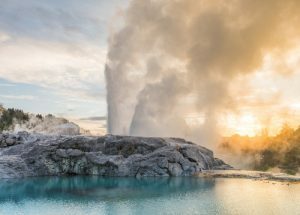 However, there is a Monster geothermal crater which guards the left side of the 14th hole and descending into the crater hole is forbidden. Among many of the other holes here, are the 14th 15th & 16th which are played alongside & across a lake. Apart from the added danger of water, on a cold & chilly winters morning watching the steam rise from the lake into the air is something special to behold. There is also no room for wayward shots on these three holes also known as “Amen Corner” by the locals where so many matches are won & lost by the smallest of errors. The unique pumice ground of this golf course allows for rapid drainage even after heavy rainfall, where the course and greens recover in only a few minutes making it very rare for golfers to lose any time playing their game of golf. The entire golf course was rebuilt in 1996 with new bunkers and undulating greens, there are four tees on every hole. Red, Yellow, White, & Blue, to test the abilities of each & every golfer. (Farewell & have a good day in Maori). N.B. Facts & figures are as reliable at the time of writing. Share the post "Golfing in New Zealand…"